IT’S A WRAP Still wrapped in white Tyvek, Academy of Construction & Design students prep the micro-house for its protective Hardie Board siding. Go big, or go home. It’s an adage well suited for the students of the Academy of Construction & Design at Cardozo Education Campus. 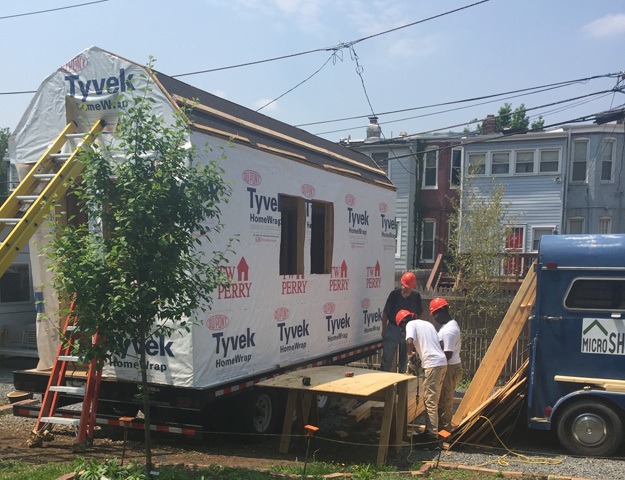 In 2012, they constructed the first student-built house in the District of Columbia. By the following year, the students had moved on to become contributors to the renovation of their high school. Now, they are tackling another project with big impact, but on a smaller scale – literally. 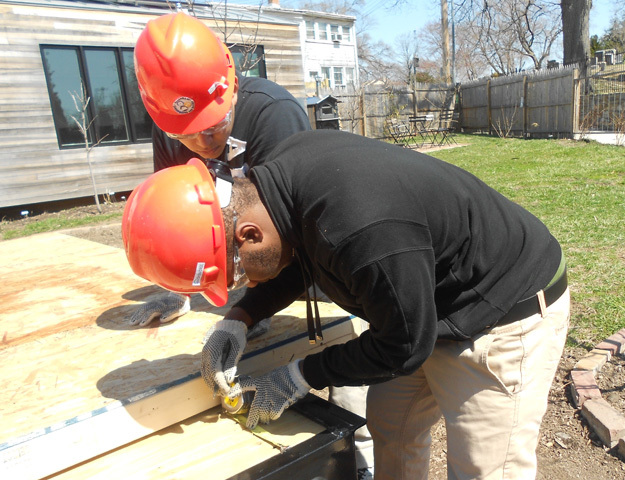 Work to Do Academy students experience a hands-on learning opportunity with the latest “Build a House, Build a Future” project at the Micro Showcase in Northeast Washington, D.C.
With its compact size, the micro-house is limited to student teams of six at each visit. Since the kickoff of this latest “Build a House, Build a Future” project on March 19, the students have already erected the home’s exterior walls. Now, they’re looking forward to incorporating innovative features into the module-style home like solar panels and a rainwater collection system. Please, Do Come In! 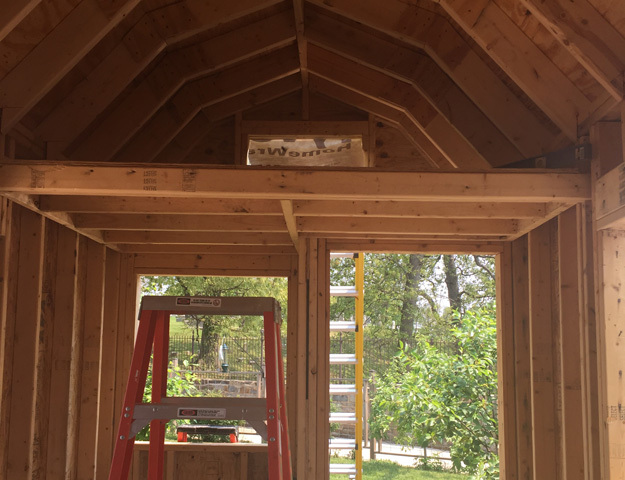 Visitors during a May 16 open house event got to view the tiny house’s interior featuring a barn-style roof.. The plans for the interior include a loft-style sleeping area, storage space over the entryway, and multi-use furnishings for small spaces (like a dining table that converts to a coffee table). And the designs are still evolving. The original plan included a v-shaped roof, but was changed to a barn-style shape to keep the open concept. “As we go, some things need to be tweaked,” said Karriem. She added that future plans for the micro-house – expected to be completed June 15 – include selling or donating the house. The micro-house project is located at 21 Evarts Street, NE in Washington, D.C. For more information, visit the Micro Showcase website at: http://www.microshowcase.com.